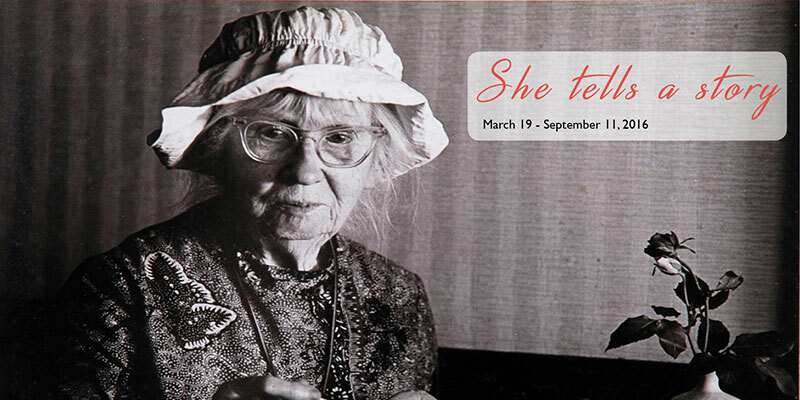 She tells a story celebrates the work of fifty-two visual artists from CAM’s permanent collection and connects the forms of visual and literary arts. Exploring the catalytic relationship between visual imagery and text, CAM invited fourteen Wilmington-area writers to compose new work inspired by these selections. This juxtaposition of visual with word illuminates how artists communicate their experiences, perspectives and world views through their chosen medium. Writers participating in this exhibition include: Anna Lena Phillips Bell; Karen E. Bender; Wendy Brenner; May-lee Chai; Cara Cilano; Amrita Das; Nina de Gramont; Dina Greenberg; Celia Rivenbark; Gwenyfar Rohler; Emily Louise Smith; Bertha Boynkin Todd; Kelly Rae Williams; and Margo Williams. 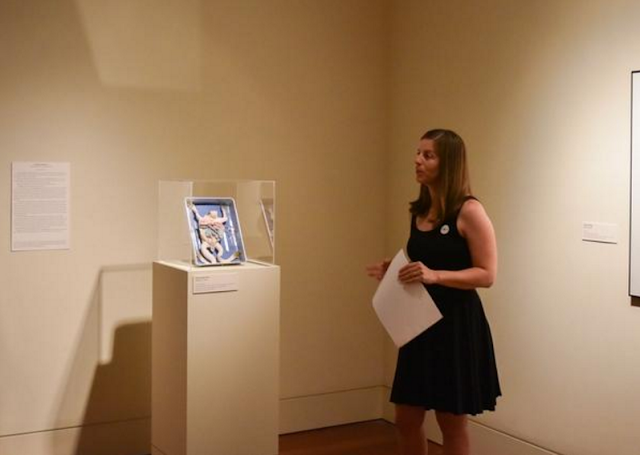 On July 28, 2016 four additional writers added their work to the exhibition: Hannah dela cruz Abrams; Christine Hennessey; Kathleen Jones and Isabelle Shepherd. I attended the original opening and reading of this exhibit, drank a bunch of wine, and told the organizers how much I desperately wanted to be included. I'm pretty sure that's why they asked me to take part in round two, and I'm forever grateful to them, and to the wine. Especially because I wrote a short piece of flash fiction inspired by a felt sculpture of a frog mid-dissection (apparently this is what speaks to me), titled it "Anatomy Lesson," and got to read it to a lovely crowd one sweltering July night (see above photo). Since then, my piece has been displayed in the museum, alongside it's inspiration, where it will remain until the exhibit comes down on September 18th. If you have the time and inclination, I recommend seeing the exhibit while you still can. Both the art and writing are wonderful, and seeing the ways writers speak to one another through their work is fascinating. A thousand thanks to Cameron Art Museum for letting me bully my way into the exhibit - it really was an honor.